M. Wolf discovered asteroid #541 Deborah. K. Reinmuth discovered asteroid #954 Li. H. E. Wood discovered asteroid #1663 van den Bos; S. Beljavskij discovered asteroid #1065 Amundsenia. M. Wolf discovered asteroids #2373 and #3626. NASA and the USAF launched X-15A Test mission # 18 in which Joe Walker flew to a maximum altitude of 23.809 km, and set an unofficial world speed record of 3533 kph (2195 mph, Mach 3.31), topping Captain Apt's 2094 mph in the X-2 on 27 September 1956. The US Air Force launched OV3-3 from Vandenberg, California, on a Scout B, to perform radiation measurements. NASA and the USAF launched X-15A Heat Tran,BLN,OBE Test/Technology mission # 165 in which William Dana reached a maximum speed of 5943 kph (Mach 5.34) and achieved a maximum altitude of 40.447 km. Perth Observatory discovered asteroid #2993 Wendy; T. Smirnova discovered asteroid #2575 Bulgaria. The NASA Apollo 15 subsatellite was launched into Lunar orbit from the CSM to continue studies the Lunar environment after the Apollo 15 astronauts had returned to Earth, the first satellite in Lunar orbit launched from a manned spacecraft. Apollo 15 was the fourth mission in which humans walked on the Lunar surface and returned to Earth: On 30 July 1971, Apollo 15 Commander David R. Scott and LM pilot James B. Irwin landed in the Hadley Rille/Apennines region of the Moon in the Lunar Module (LM) while the Command and Service Module (CSM), with CM pilot Alfred M. Worden, continued in Lunar orbit. During their stay on the Moon, the astronauts set up scientific experiments, took photographs, and collected Lunar samples. The LM took off from the Moon on 2 August, and the astronauts returned to Earth on 7 August. Apollo 15 was launched on 26 July 1971 on Saturn V SA-510 from Pad 39A at the Kennedy Space Center, Florida. The spacecraft was inserted into Earth orbit 11 minutes 44 seconds after liftoff, at 13:45:44 UT, and translunar injection took place at 16:30:03 UT. The CSM separated from the S-IVB stage at 16:56:24 UT, and docked with the LM at 17:07:49 UT, televised using an onboard color camera. The S-IVB stage was released and sent into a Lunar impact trajectory, impact occurring on 29 July at 20:58:42.9 UT at 1.51 S, 11.81 W with a velocity of 2.58 km/s at a 62 degree angle from the horizontal, 188 kilometers northeast of the Apollo 14 landing site and 355 kilometers northeast of the Apollo 12 site. The impact was detected by both the Apollo 12 and Apollo 14 seismometers, left on the moon in November 1969 and February 1971. A short was discovered in the service propulsion system, and contingency procedures were developed for using the engine. A mid-course correction was performed on 27 July at 18:14:22 UT and another on 29 July at 15:05:15. During the translunar cruise, it was discovered that the LM range/range-rate exterior glass cover had broken and a small water leak had developed in the CM requiring repair and clean up, in part to avoid breathing in the glass shards. The Scientific Instrument Module (SIM) door was jettisoned at 15:40 UT on 29 July, and Lunar orbit insertion took place at 20:05:47 UT. The descent orbit maneuver was executed at 00:13:49 UT on 30 July. Scott and Irwin entered the LM and the LM-CSM undocking maneuver was initiated at 17:48 UT, but undocking did not take place. Worden found a loose umbilical plug and reconnected it, allowing the LM to separate from the CSM at 18:13:30 UT. The LM fired its descent engine at 22:04:09 UT and landed at 22:16:29 UT on 30 July 1971 in the Mare Imbrium region at the foot of the Apennine mountain range at 26.1 N, 3.6 E, 600 meters north-northwest of the proposed target. The CSM remained in a slightly elliptical orbit from which Worden performed scientific experiments. About two hours after landing, following cabin depressurization, Scott performed a 33 minute 7 second standup EVA in the upper hatch of the LM, during which he described and photographed the landing site. The first crew EVA on the Lunar surface began at 13:04 UT 31 July. The crew collected and stowed a contingency sample, unpacked the ALSEP and other experiments, and prepared the Lunar Roving Vehicle (LRV) for operations. Some problems were encountered in the deployment and checkout of the LRV, used for the first time, but they were quickly resolved. The first EVA traverse was to the Apennine mountain front, after which the ALSEP was deployed and activated, and one probe of a Heat Flow experiment was emplaced. A second probe was not emplaced until EVA-2 because of drilling difficulties. The first EVA lasted 6 hours 32 minutes 42 seconds. The second EVA began at 11:49 UT 1 August. 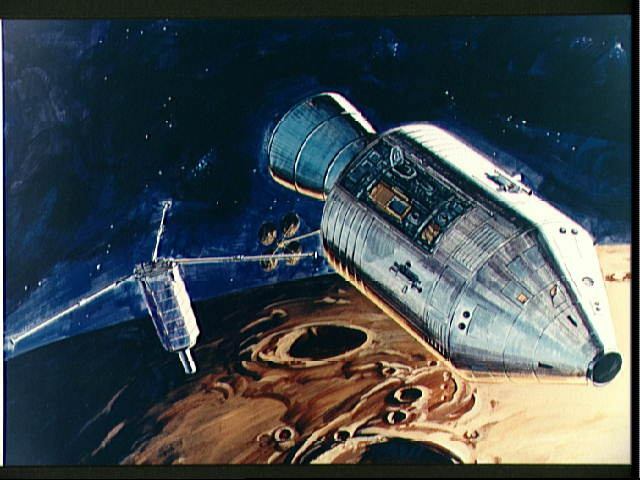 The astronauts made a maintenance check on the LRV, then began the second planned traverse of the mission. On completion of the traverse, Scott and Irwin completed the placement of heat flow experiment probes, collected a core sample, and deployed the American flag. They then stowed the sample container and the film in the LM, completing a second EVA of 7 hours 12 minutes 14 seconds. The third EVA began at 8:52 UT 2 August, included another traverse, and ended 4 hours 49 minutes 50 seconds later. After the final EVA, Scott performed a televised demonstration of a hammer and feather falling at the same rate in the Lunar vacuum. The total Apollo 15 Lunar surface EVA time was 18 hours 34 minutes 46 seconds. During the three moonwalks, Scott and Irwin covered 27.9 km, collected 76.8 kg (170 pounds) of rock and soil samples, took photographs, and set up the ALSEP and performed other scientific experiments. This was the first mission to employ the LRV, used to explore regions within 5 km of the LM landing site. While the Lunar Module was on the Moon, Worden completed 34 Lunar orbits in the CSM, operating SIM experiments and cameras to obtain data concerning the Lunar surface and environment. The SIM equipment included a panoramic camera, gamma ray spectrometer, mapping camera, laser altimeter, and a mass spectrometer. X-ray spectrometer data indicated a richer abundance of aluminum in the highlands, especially on the far side, but greater concentrations of magnesium in the maria. The LM ascent stage lifted off from the Moon at 17:11:22 UT on 2 August, televised for the first time, after 66 hours, 55 minutes on the Lunar surface. After the LM docked with the CSM at 19:09:47 UT, the Lunar samples, film, and other equipment were transferred from the LM to the CSM. The LM was jettisoned at 01:04:14 UT on 3 August, after a one orbit delay to ensure LM and CSM hatches were completely sealed. The LM impacted the Moon on 3 August 03:03:37.0 UT at 26.36 N, 0.25 E, 93 km west of the Apollo 15 ALSEP site, with an estimated impact velocity of 1.7 km/s at an angle of ~3.2 degrees from horizontal. Its impact was recorded by the Apollo 12, Apollo 14, and Apollo 15 seismometers, left on the Moon during each of those missions. Experiments were performed from orbit over the next day. After Apollo 15 executed an orbit-shaping maneuver, the scientific subsatellite was spring-launched from the SM SIM bay at 20:13:19 UT on 4 August into a 102.0 x 141.3 km Lunar orbit. The satellite measured interplanetary and Earth magnetic fields near the Moon, and carried charged-particle sensors and equipment to detect variations in Lunar gravity caused by mascons (mass concentrations). Transearth injection began on the next orbit with a 2 minute, 21 second main engine burn at 21:22:45 UT. On 5 August, Worden carried out the first deep space EVA when he exited the CM and made three trips to the SIM bay at the rear of the SM to retrieve film cannisters and check the equipment. Total EVA time was 38 minutes, 12 seconds. The CM separated from the SM at 20:18:00 UT on 7 August. During descent, one of the three main parachutes failed to open fully, resulting in a descent velocity of 35 km/hr (21.8 mph), 4.5 km/hr (2.8 mph) faster than planned, causing a hard but safe landing. Apollo 15 splashed down in the Pacific Ocean on 7 August 1971 at 20:45:53 UT (4:45:53 PM EDT) after a mission elapsed time of 295 hours, 11 minutes, 53 seconds (12 days 7 hours 12 minutes). The splashdown point was 26 deg 7 min N, 158 deg, 8 min W, 330 miles north of Honolulu, Hawaii and 9.8 km (6.1 mi) from the recovery ship USS Okinawa. The astronauts were carried to the ship by helicopter, and the CM was retrieved and placed on board. Performance of the spacecraft, the first of the Apollo J-series missions (long duration stays on the Moon with a greater focus on science than on previous flights), was excellent for most aspects of the mission. The primary mission goals of exploration of the Hadley-Appenine region, deployment of the ALSEP and other scientific experiments, collection of Lunar samples, surface photography, and photography and other scientific experiments from orbit, and engineering evaluation of new Apollo equipment, particularly the rover, were achieved. Scott, 39, was an Air Force Colonel on his third spaceflight (he'd flown previously on Gemini 8 and Apollo 9), Worden, 39, was an Air Force Major on his first spaceflight, and Irwin, 41, was an Air Force Lt. Colonel also on his first spaceflight. The Apollo 15 command module "Endeavor" is on display at the USAF Museum at Wright-Patterson Air Force Base, Dayton, Ohio. The Apollo program included a large number of uncrewed test missions and 12 crewed missions: three Earth orbiting missions (Apollo 7, 9 and Apollo-Soyuz), two Lunar orbiting missions (Apollo 8 and 10), a Lunar swingby (Apollo 13), and six Moon landing missions (Apollo 11, 12, 14, 15, 16, and 17). Two astronauts from each of the six missions walked on the Moon (Neil Armstrong, Edwin Aldrin, Charles Conrad, Alan Bean, Alan Shepard, Edgar Mitchell, David Scott, James Irwin, John Young, Charles Duke, Gene Cernan, and Harrison Schmitt), the only humans to date (2014) to have set foot on another solar system body. NASA's Apollo 15 astronauts executed the transearth injection maneuver which took them out of Lunar orbit for their return home. USSR launched TKS VA 009P and 009L from Baikonur in a repeat test of the VA capsules from LVI-1 of a month earlier; in this launch a booster explosion destroyed one of the capsules. USSR launched a repeat test of the TKS VA capsules from LVI-1 of a month earlier on 4 August 1977. The VA capsules 009P and 009L were launched on Proton-K 293-01. However, the booster failed at 49 seconds after launch because of the first stage engine steering unit failure at T+40.1 seconds. The SAS launch escape system pulled the top capsule (009P) away from the exploding Proton rocket, and it was successfully recovered. The lower capsule (009L) was lost with the booster. L. G. Karachkina discovered asteroid #3063 Makhaon. The first flight of the Ariane 3, launched from Kourou, carried Eutelsat 2 and France's Telecom 1A communications satellites into space, which were initially positioned in geosynchronous orbit at 10 deg E and 8 deg W, respectively. Russia launched Molniya 3-45 from Plesetsk for operation of the long range telephone and telegraph communications system, which replaced Molniya 3-37. Died, Jeanne Calment, who lived for 122 years 164 days, the longest confirmed lifespan for any human being in history. Spain's Amazonas satellite was launched from Baikonur on a Proton booster and positioned in geosynchronous orbit at 61 deg W with 36 Ku-band, and 27 C-band transponders to provide broadband video and Internet to North and South America and western Europe. NASA's Phoenix lander, launched 4 August 2007, was a robotic spacecraft on a space exploration mission to Mars under the Mars Scout Program. The Phoenix lander descended to the surface of Mars on 25 May 2008. Mission scientists used instruments aboard the lander to search for environments suitable for microbial life on Mars, and to research the history of water there. Mars Reconnaissance Orbiter's High Resolution Imaging Science Experiment (HiRISE) camera photographed Phoenix suspended from its parachute during its descent through the Martian atmosphere on 25 May 2008, the first time one spacecraft photographed another in the act of landing on a planet. Phoenix landed on Mars at 4:38 PM (PDT) at 68.218830 deg N 234.250778 deg E, NASA's sixth successful landing on Mars out of seven attempts, and was the first successful landing in a Martian polar region. The lander completed its mission in August 2008, and made a last brief communication with Earth on 2 November 2008 as available solar power dropped with the Martian winter. The mission was declared concluded on 10 November 2008 after engineers were unable to re-contact the craft. Following unsuccessful attempts to contact the lander using the Mars Odyssey orbiter up to and past the Martian summer solstice on 12 May 2010, JPL declared the lander to be dead. The program was considered a success because it completed all planned science experiments and observations.